Plants perennial; cespitose, not rhizomatous. Culms 35-120(150) cm, stout. Sheaths rounded below, shiny, apices glabrous or sparsely hairy, hairs to 6 mm; ligules 0.1-0.3 mm; blades (3)10-45(60) cm long, (1)2-5(6) mm wide, flat to involute, glabrous abaxially, scabridulous adaxially, margins smooth or scabridulous; flag blades ascending. Panicles (10)15-45 cm long, 15-25 cm wide, diffuse, subpyramidal, often included in the uppermost sheath; primary branches 1.5-13 cm, spreading 30-90° from the rachis; secondary branches spreading, without spikelets on the lower 1/4-1/3; pulvini glabrous; pedicels 0.5-2 mm, spreading, glabrous or scabrous. 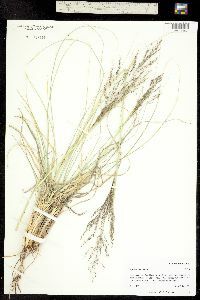 Spikelets 1.3-2.8 mm, purplish or greenish. Glumes unequal, lanceolate to ovate, membranous; lower glumes 0.5-1.8 mm, often without midveins; upper glumes 1.1-2.4(2.8) mm, at least 2/3 as long as the florets; lemmas 1.2-2.5 mm, ovate, membranous, glabrous, acute; paleas 1.1-2.4 mm, ovate, membranous, glabrous; anthers 1.1-1.8 mm, yellowish to purplish. Fruits 1-1.4 mm, ellipsoid, reddish-brown, striate. 2n = 80, 90, 108, 126. 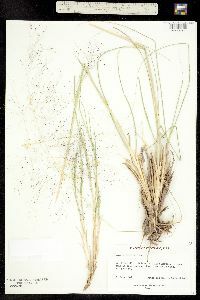 Sporobolus airoides grows on dry, sandy to gravelly flats or slopes, at elevations from 50-2350 m. It is usually associated with alkaline soils. Its range extends into northern Mexico. 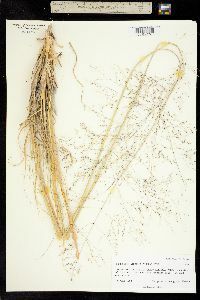 Perennials, Terrestrial, not aquatic, Stems nodes swollen or brittle, Stems erect or ascending, Stems caespitose, tufted, or clustered, Stems terete, round in cross section, or polygonal, Stem internodes hollow, Stems with inflorescence less than 1 m tall, Stems with inflorescence 1-2 m tall, Stems, culms, or scapes exceeding basal leaves, Leaves mostly cauline, Leaves conspicuously 2-ranked, distichous, Leaves sheathing at base, Leaf sheath mostly open, or loose, Leaf sheath smooth, glabrous, Leaf sheath hairy at summit, throat, or collar, Leaf sheath and blade differentiated, Leaf blades linear, Leaf blades 2-10 mm wide, Leaf blades mostly flat, Leaf blade margins folded, involute, or conduplicate, Leaf blades mostly glabrous, Leaf blades more or less hairy, Ligule present, Ligule a fringe of hairs, Inflorescence terminal, Inflorescence an open panicle, openly paniculate, branches spreading, Inflorescence solitary, with 1 spike, fascicle, glomerule, head, or cluster per stem or culm, Inflorescence branches more than 10 to numerous, Flowers bisexual, Spikelets pedicellate, Spikelets laterally compressed, Spikelet less than 3 mm wide, Spikelets with 1 fertile floret, Spikelets solitary at rachis nodes, Spikelets all alike and fertille, Spikelets bisexual, Spikelets disarticulating above the glumes, glumes persistent, Rachilla or pedicel glabrous, Glumes present, empty bracts, Glumes 2 clearly present, Glumes distinctly unequal, Glumes shorter than adjacent lemma, Glumes 1 nerved, Lemmas thin, chartaceous, hyaline, cartilaginous, or membranous, Lemma similar in texture to glumes, Lemma 1 nerved, Lemma glabrous, L emma apex acute or acuminate, Lemma awnless, Lemma straight, Palea present, well developed, Palea membranous, hyaline, Palea about equal to lemma, Palea 2 nerved or 2 keeled, Stamens 3, Styles 2-fid, deeply 2-branched, Stigmas 2, Fruit - caryopsis, Caryopsis ellipsoid, longitudinally grooved, hilum long-linear. 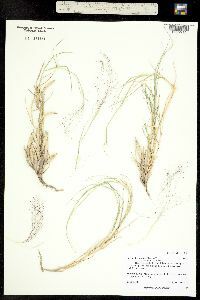 Common Name: alkali sacaton Duration: Perennial Nativity: Native Lifeform: Graminoid General: Tufted perennial grass growing in hard and dense clumps, 50-100 cm tall; stems firm and tough, from a hard, knotty base. Vegetative: Sheaths rounded, open, glabrous, or short-ciliate on upper margin, with few hairs on either side of collar; ligule usually a minute crown of short hairs, often bordered by small tufts of long hairs; blades firm and fibrous, involute, 2-6 mm wide, 5-25 cm Inflorescence: Panicle 12-40 cm long, typically open and with widely spreading branches, branchlets, and spikelets; spikelets 2-3 mm long, brownish or lead-colored; glumes thin and rounded, first glume about half the length of lemma, second glume two-thirds or more the length of the lemma; lemma thin, rounded, blunt to narrowly acute; palea about as long as the lemma and usually broader at apex. 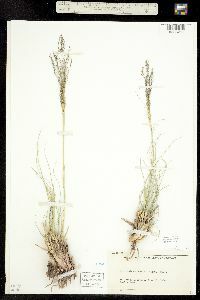 Ecology: Found on sandy plateaus, washes, bottomlands and flats, often in alkalin soils from 2,500-6,500 ft (762-1981 m); flowers from May-October. Distribution: Most of western North America: Brit. Col. south to CA and east to TX; south to n MEX. 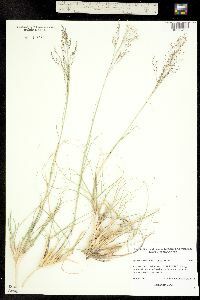 Notes: Sporobolus species have single seeded spikelets with unequal glumes, no awns, and most often small seeds which readily fall after maturing hence the common name "dropseed." 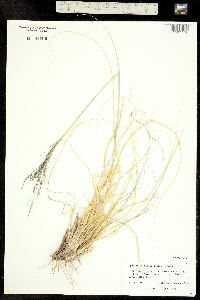 S. airoides is a robust perennial bunchgrass with stiff stems and a knotty base; distinguished by having rolled, drooping leaves and large cresting, fountain-like growth form with open, loose inflorescences bearing spikelets 2-3 mm long. 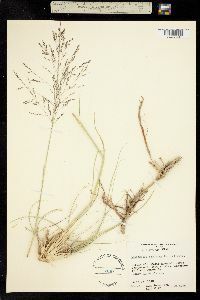 Distinguished from the similar S. wrightii by possessing pedicels which are spreading and not appressed, and secondary panicle branches without spikelets to the base. 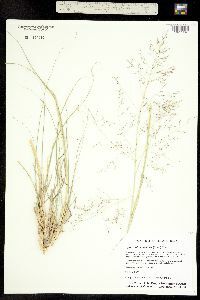 S. wrightii is usually much taller, too. 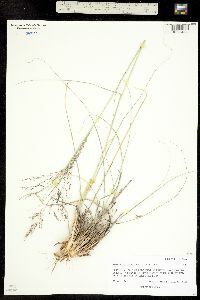 Also could be confused with the smaller S. cryptandrus, which has flag blades perpendicular to the culms (flag blades ascending in S. airoides) and mostly appressed pedicels and secondary panicle branches (S. airoides has somewhat spreading pedicels, though often not fully at a 90 degree angle). Ethnobotany: Seeds used as food by various Native American groups; ground and mixed into a porridge, combined with with corn meal or used for flour. 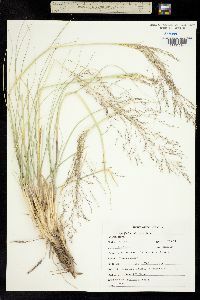 Synonyms: Agrostis airoides Editor: SBuckley 2010, FSCoburn 2014, AHazelton 2015 Etymology: Sporobolus is Greek for "seed-caster", while airioides means it is like Aira, a genus of Old World grasses. Stout perennial 4-10 dm, the base of the large clumps densely clothed with the shiny, cream-colored old sheaths; sheaths glabrous or slightly pilose at the upper corners; blades narrow and mostly involute, finely scaberulous above and ±hirsute near the base; panicle open, pyramidal, 12-40 נ(5-)10-20 cm, sometimes partly enclosed at base in the uppermost sheath, the branches spreading, alternate or irregularly disposed, bearing spikelets chiefly toward the tips; first glume 0.7-1.2+ mm, the second 1.5-2+ mm; lemma 1.8-2.5(-3) mm; palea about equaling the lemma; anthers 1.2-1.5 mm; 2n=ca 80, ca 90, 108, 126. Low-lying, alkaline meadows; widespread in interior w. U.S. and n. Mex., e. to the Dakotas, Mo., and Okla. Ours is the widespread var. airoides.